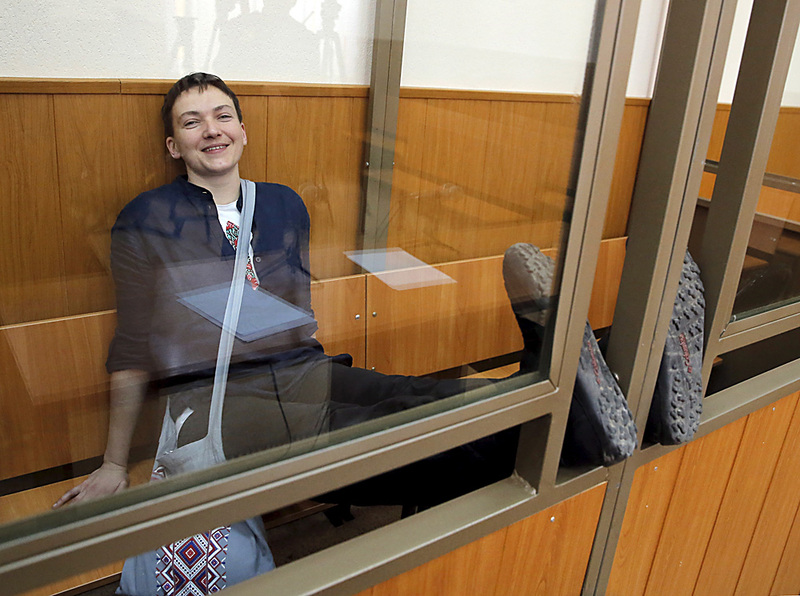 Former Ukrainian army pilot Nadezhda Savchenko smiles from a glass-walled cage during a verdict hearing at a court in the southern border town of Donetsk in the Rostov region, Russia, March 22, 2016. Ukrainian President immediately makes offer of exchange. The Donetsk City Court of the Rostov region sentenced Ukrainian pilot Nadia Savchenko, who was convicted of directing a mortar attack that killed two Russian journalists, to 22 years in a penal colony. It was also announced that the term that Savchenko has served since her arrest on June 30, 2014, would count towards her penalty. Therefore, Savchenko is due to serve a term of 20 years. According to Russian investigators, Savchenko, a Ukrainian Armed Forces officer, was at the base of the Aidar battalion near the town of Metalist, in Slovianoserbsk district, the Lugansk Region on June 17, 2014. According to their findings she was conducting secret observation and an artillery fire adjustment at a Lugansk militia roadblock where civilians, including three journalists from Russia's VGTRK broadcaster, were present. The shelling killed two of them – Igor Kornelyuk and Anton Voloshin. The Ukrainian citizen is also charged with illegally crossing the Russian border from the territory of the Lugansk Region, which she committed no later than June 23, 2014 near the local checkpoint, Donetsk-Severny. Savchenko and her defense lawyers deny involvement in the crimes. Ukrainian President Petro Poroshenko says he is ready to transfer Alexander Alexandrov and Yevgeny Yerofeyev, Russian servicemen detained in Ukraine, to Russia in exchange for Savchenko. "I am ready, in turn, to hand the two Russian servicemen detained in our territory for involvement in armed aggression against Ukraine over to Russia. The court proceedings on their cases are in the final phase. Immediately after their completion, I am ready to ensure their departure for Russia through relevant procedures," Poroshenko said in a statement after the court handed down its sentence. Meanwhile, experts doubt that an exchange is possible. "The question of an exchange today is irrelevant. In the long term it would be possible only after recognition by Ukraine and Savchenko of the fact of her crime," Alexei Chesnakov, the general director of the Center for Current Policy, told RBTH. What about the Minsk agreements? The Minsk agreements do provide for the exchange of all prisoners of war, as well as hostages. However, as stated earlier in an interview with RBTH, Evgeny Minako, the director of the International Institute of Political Expertise explained that, "formally Savchenko, as the defendant in a criminal murder case, is neither one nor the other" and these agreements concern only Ukraine and the unrecognized republics [Ed. : referring to the two self-proclaimed states in eastern Ukraine – the Donetsk People’s Rebublic and the Lugansk People’s Republic]. Russia, the guarantor of the Minsk agreements, and not their contractor, is not a party to the conflict.